This month's tie one on assignment was to make an apron from a tea towel (or dish towel, kitchen towel, bar towel, etc.) Easy as pie, and after one false start (okay, maybe not as easy as pie) I had this cute pink apron made from a vintage kitchen towel. 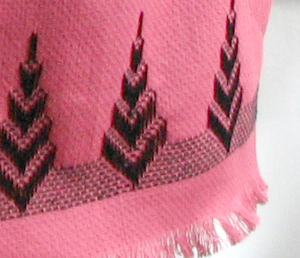 The ends of the towel had different motifs, which worked perfectly for my idea, which was: to cut the towel in half off-center, making one longer panel for the main part of the apron, and then make two shorter side panels from the shorter half. You can see the side panels in the second photo. (The apron fits me a bit better than it fits my skinnier dressmaker's dummy -- skinnier because my dummy didn't give birth 9 months ago!) I serged the raw edges of the side panels, stitched them to the front panel, gathered the whole thing and then just used a length of some leftover black bias tape for the waistband/ties. I'm much happier with this apron, actually (than the last one) because it's very usable. The side panels protect without getting in the way, and the fabric is a textured and very absorbent cotton (I think). See detail photo for the texture -- also for a close-up of the embroidery. I know there is a name for this style of embroidery but I cannot remember it and I don't have any of my needlework books handy to check. And it's totally washable. 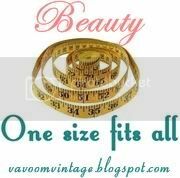 The fabric is a bit thicker and stiffer as well, which also helps. Definitely will be avoiding the potentially limp fabrics in the future, no matter how much I like the color! Now, for the false start! The day this month's theme was announced I thought, "this will be so easy! And perfect! 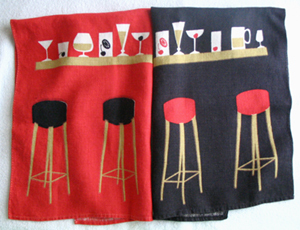 Now, to find some cool vintage towel or two on ebay"...and I immediately found an auction that was about to end, for a set of vintage bar towels (well, I'm assuming they're "bar towels" by the motifs, but they're kind of bigger and linen so they may really be "kitchen" towels). No-one bid against me, I won them a few hours later for just a few dollars, and then I waited excitedly to get them in the mail. My plan was to take the two towels and match up the designs, making a big color-blocked towel, then cutting it down to a good length and just using bias tape to make the waistband/ties (see photo for a mock-up of the apron that didn't happen). I thought it would look really neat, and I think it would have except...when I got the towels I thought "this will be the coolest apron", but I just couldn't do it. I hung them over a chair in the dining room for a couple days and thought about it, and when Evan asked "where did we get these really cool towels" I decided I just couldn't cut them up!! 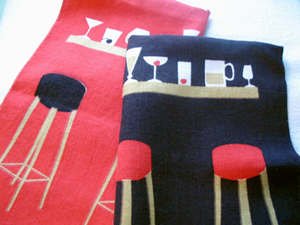 So, they became our new cool vintage bar towels, and I began searching for another vintage towel. 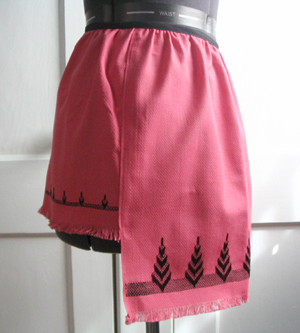 Luckily I found the pink and black one and it was shipped quickly so I had plenty of time to make the apron. 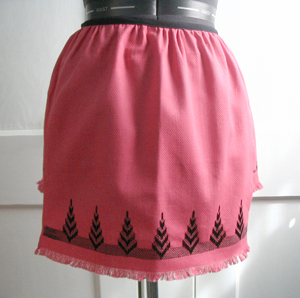 Update: see more photos in my flickr apron set!